Prime Minister Imran Khan launched Pakistan Citizen Portal to hear and address problems of public. 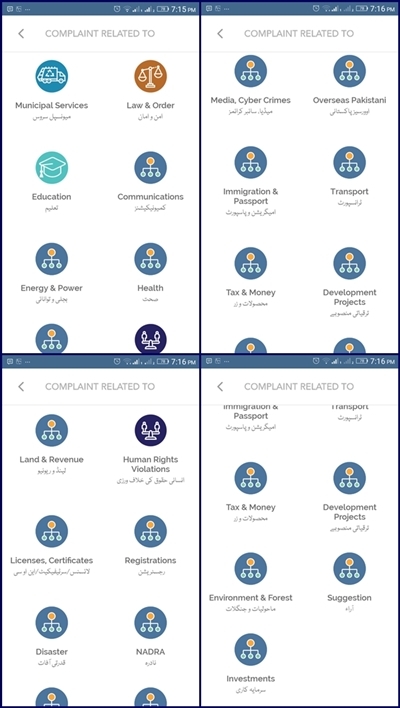 This portal is a mobile app through which citizens can send their complaints to the departments concerned. Pakistanis at home, Overseas Pakistanis and Foreigners in Pakistan will be able to contact the prime minister through this mobile app. Complaint cell has been set up at Prime Minister Office. About 3760 federal and provincial departments are linked with the portal and the letters had been written to all the provincial governments about the new initiative. This portal allows to register complaints about multiple sectors and government departments. Citizens can upload picture/ video/ audio files in support of their complaints. Currently it is available only on android however IOS version will soon be introduced so that citizens having iPhone can also register their complaints. Speaking at the launch of the portal, prime minister said that this app will enable the government to understand the performance of ministries and departments. Future policies will be made after getting public response and feedback. Idea behind the Citizen’s Portal is that “No complaint will remain unresolved”. Install Pakistan Citizen Portal mobile application on your android phone. Select from Inland Citizen, Overseas Pakistani or Foreigner whichever is applicable. Enter your mobile number (in the format of 03xx-xxxxxxx)and click continue. On next screen page enter your full name, gender, date of birth, username, password to login, CNIC, province, district, tehsil and address. Login to view the status of your complaints and to create new complaint. To create complaint, click on the + sign in the bottom right corner. Select the category of complaint related to. There are several categories e.g. Health, Education, Municipal Services, Law and Order, Communications, Energy and Power, Land and Revenue, Human Rights Violations, Licenses, Certificates, Registrations, Disaster, NADRA, Media, Cyber Crimes, Overseas Pakistanis, Immigration and Passport, Transport, Tax and Money, Development Projects, Environment and Forest, Investments and Suggestion etc. Once main category is selected, there are several related sub-categories. Add other details. You can also attach audio, video or photo with your complaint. 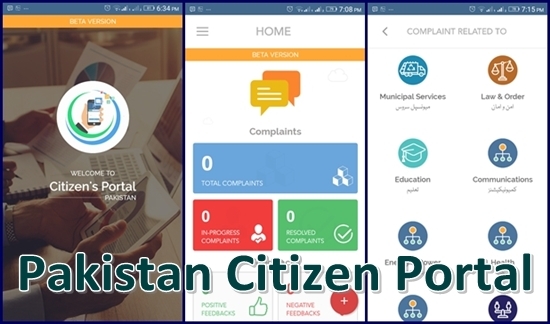 Pakistan Citizen Portal is a simple tool which allows citizens whether he or she is in Pakistan or lives abroad to register their complaints through a mobile app to the concerned government departments. A report regarding the status of complaints received would be regularly sent to the Prime Minister. Complaints will automatically reach the heads of relevant departments who would take appropriate step to address the issue. It has been planned to resolve and reply to the initiator within 10 days.